REV’IT knows there are some of us who ride all year long, in all weather - or try to. With their new Stratos GTX gloves, they seek to lend a hand to those intrepid enough to ride through the depths of winter. Released just in time for the cold weather, the REV’IT! Stratos GTX Gloves join REV’IT’s formidable glove lineup and are positioned as a cold weather, fully waterproof glove to keep you on the road while other riders are stuck tinkering with their bikes in their garages for the next 6 months. 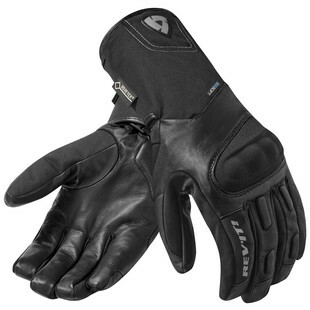 I’ll tell you, last winter it got cold here in Philadelphia, and many late-night commutes I was left struggling to operate my clutch and front brake due to how numb my hands became over a short 10 minute ride. If it rained, or worse - snowed - forget it. In the wet, GoreTex is everything, and you are getting that here, baked right into the glove. Additionally, you’ve got the tried-and-true Thinsulate® tri-fleece liner to keep your hands warm. Insulation, paired with windproof / waterproof means toasty mitts that you can actually feel. Nothing is worse than coming home and having to defrost your hands before you make dinner. As much as these gloves keep you comfortable, they are also going to keep you safe. You’re looking at goatskin, paired with PWR|Shell for abrasion resistance, SEESOFT molded knuckle, with padding at the palm, fingers, and thumb. These aren’t your average winter gloves. For me, even if all of the above wasn’t compelling enough, I love that they went with a nice, understated styling that isn’t bulky or over-the-top. So often do brands decide their high-tech gear needs to look like a science fiction prop, but these gloves maintain a classic profile that I would not be embarrassed to wear on a cold-weather tour. Seriously though - when you already can’t feel your fingers and the sky starts to open up, trust me when I say you’ll want something like the Stratos GTX.